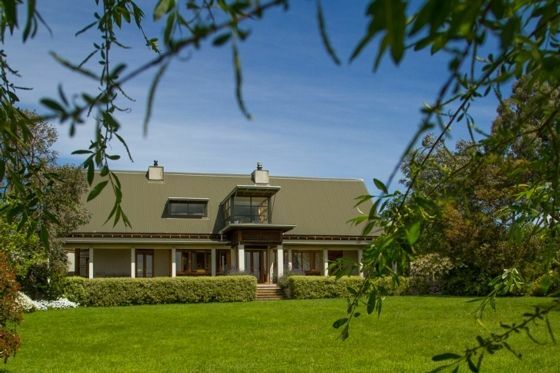 The lodge is the ideal setting for friends and family to gather and celebrate a special occasion, or just to spend time together and enjoy the famous wine region of Martinborough. Our sprawling lawn and landscaped garden would make the perfect setting for a boutique wedding. The house has numerous areas to relax both indoors and outdoors, with multiple doors opening out to provide a sense of alfresco living. The open plan living and dining area has wonderful indoor/outdoor flow with an impressive kitchen. It is perfectly heated in winter with a wood burner and underfloor heating. The lounge looks out over the lawn and gardens to the olive grove; bliss. Our master bedroom offers a super-king bed with ensuite, the second bedroom also has a super-king bed, while the third bedroom offers both a super-king bed and king-single bed. This room can be configured to three singles. Upstairs in our mezzanine floor, we have a super-king bed, single trundle bed and a luxurious sofa bed if needed. Amble down the drive to our fully renovated cottage with sleeping for five guests (if required). A super king bed, king single upstairs on the mezzanine and a fold out double sofa bed in the lounge. The interior is modern and sophisticated. It is appointed with the very best in furnishings, bedding and kitchenware. The rate includes first morning breakfast provisions of breads, spreads, and milk. Along with some extra treats for you to enjoy. Check in is from 2pm (we may be able to accommodate you earlier upon request). Check out time is 11am. A bond of $350 is charged and refunded after your stay when all is well with the house. The cottage is also available separately on a separate listing. Long Weekends are a minimum three night stay or a three night charge and a minimum charge of eight guests. Dogs are welcome at a fee of $10.00 per day. Dogs are not permitted on the furniture and must have their own sleeping beds. Large grounds and Olive Grove setting. Lovely peaceful and relaxing spot with plenty of space for family or large group to enjoy. We celebrated a big family event there and thoroughly enjoyed our stay. It's well equipped with everything you could need. We held a large, 3-generation, family get-together at the Summer Lodge and it was perfect. Lots of room for people to spread out into their own groups or to come together for meals. The well-appointed kitchen worked effectively with up to 4 people preparing meals at any one time. The pool was popular. Everything was clean and as it should be. Lovely place to stay and 100% recommended. Amazing place, such great facilities and friendly owner made sure everything was detailed out. Thanks Rochelle! Fantastic asic combination of locations n, luxury and tranquility. Everything we hoped for and then some. Loved the house - has a beautiful feel about it. Loved the house - has a beautiful feel about it. Very comfortable and spacious. Only comment I would like to make - we were 3 couples staying and I read the description as 3 bathrooms - this isn't truly accurate - the 3rd bathroom is a toilet off the laundry.